Ella Robinson Howard was born in Columbus, Ohio, in 1860. She received her art education and worked as an artist before marrying John Wilmot Estill in 1887. After the birth of their third child, Estill was diagnosed with tuberculosis and was sent to Oracle, Arizona Territory, for treatment and recuperation. Much of her time was spent outdoors in the sun painting wildflowers. When her health improved, her family joined her, and in 1906 they moved to Tucson, where Estill raised her family and continued to paint. The Estills were very active in the community and both became well-known in Arizona. In 1912, the Arizona Gazette reported that an exhibit at the fair “established Mrs. Estill’s reputation as a painter of desert plants.” The article also comments, “Mrs. Estill paints the commonest desert plants, such as the sahuaro, ocotillo, prickly pear, barrel cactus, poppies and other flowers. Her coloring is simply wonderful. It is hardly possible that there could be more faithful reproductions of cacti and other Arizona plants.” After their children were grown the Estills moved to Los Angeles where she remained until her death in 1941. 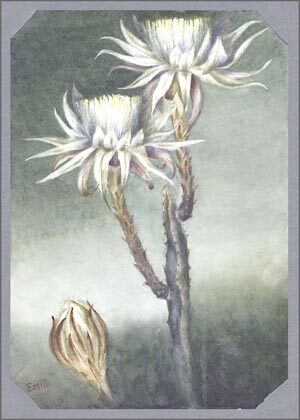 Estill's work appeared in National Geographic Magazine , and she contributed watercolor paintings of cacti to John James Thornber’s The Fantastic Clan, The Cactus Family . In 1925, her cactus paintings were exhibited at the Los Angeles Museum of Art. Ella Howard Estill gave over 500 of her paintings to the University of Arizona Herbarium that was then under the curatorship of Dr. Charles Mason. These are now part of the Herbarium’s permanent illustration collection. The paintings date from the early to mid-1900s, and while they are not considered “scientific illustrations”, they comprise a large body of accurate depictions of native plants of Arizona and California. A selection of these paintings from the University of Arizona Herbarium's collection can be seen here along with works by other artists . Two works by Estill from collection of Richard and Patricia Wiedkopf can be seen in our online exhibit Botanical Art of the Sonoran Desert: Past and Present.